This is a fun little series. Lighthearted. Being five books, it’s hard to give it a full five stars, as there is a lot of ups & downs. But overall, the 5 book set is a solid 4 stars. Solid. Although each book has different mysteries, the characters slowly develop throughout the books. Almost too slowly though. Sometimes I feel like I need more in the character development. I do like how new characters get introduced. There are hints of them previously, and they don’t feel like they just pop in with the next book. I give the author major kudos for that! The plots transpire at a nice pace. I don’t feel like there is too much nonsense, and it flows well. Each book continues on from the last, but when one finishes, it’s not a cliff-hanger. You can’t wait to read the next one, but you don’t feel like you need to finish the story. I like that about this series. The books are suspenseful and mysterious. You’re trying to solve the mystery along with the girls. The romance in the books take place almost in the background and is not in your face. Good, because I’m not a romance fan. The hint of it is very nice. The books are a nice relaxing read. I’ve enjoyed these books, and I will admit I have sought out other books by the author. All are good reads! A three-hundred year old mystery, four magical sisters and a cat. 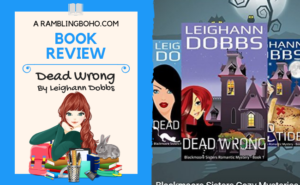 The Blackmoore sisters discover their paranormal powers as they find themselves scrambling to find a real killer while they battle a crooked Sheriff, planted evidence, and a long list of suspects that all had a reason to kill. 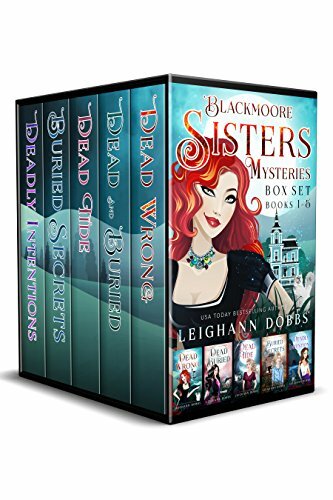 This is a box-set of the first five books in the Blackmoore Sisters Cozy Mystery series.